Mosstyn has been a leader, visionary and highly respected partner and colleague in the parking industry for over 20 years. 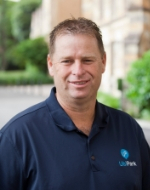 Mosstyn is currently the Founder and CEO of UbiPark which provides exciting new parking technologies to assist consumers to save time and money when looking for parking. UbiPark also provides car park owners with marketing and data analytic tools to increase revenues and reach customers in the digital world.